By agreement with the state, East Marlborough is not allowed to limit truck traffic on Route 82. EAST MARLBOROUGH — Residents frustrated by truck traffic on Route 82 — and noise from heavy vehicles that is shaking their homes apart — may not be able to get much in the way of help from the township, as officials admit they are unable to put weight limits on the roadway. 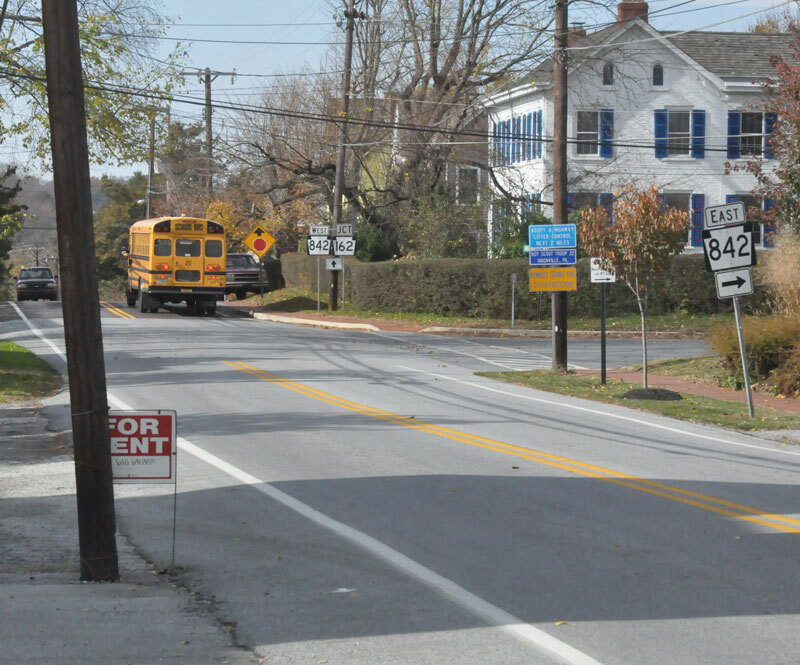 Although the township is responsible for maintaining the roadway, it agreed when taking the road back from the Pennsylvania Department of Transportation to do nothing to limit truck traffic on the road, used a key link to Coatesville from U.S. 1. The issue seems to be most acute in the old village area, near where Route 162 crosses the highway west to where Route 842 joins and ultimately leaves the roadway. Jack Greenwood brought the issue before the Board of Supervisors in September, who promised to look into the issue and see if the township had any legal options. Greenwood, who helped lead the efforts some years back to have the stop sign installed at the intersection of Route 82 and 162, pressed the board again on the subject at this month’s meeting. The roadway in that area dates back to colonial times — it was used by Hessians to cut behind Gen. George Washington’s forces during the Battle of Brandywine — the buildings in the area have relatively little in the way of setback from the road. Although it runs right through the old village site, Route 82 is a fairly busy artery and serves as the most direct route from Delaware and the southern part of the county to Coatesville and some areas in the northern part of the Chester County. The answer, township solicitor Frone Crawford said, is basically “not really.” While the township can impose weight limits for bridges along the roadway, it cannot impose them for road itself, as long as it was built to state standards. Greenwood expressed his displeasure and again pushed the supervisors to look for options, as homes, including his, he said, were being damaged by the traffic. Supervisors chair Cuyler Walker said he understood Greenwood’s frustration, but that the township was bound by the laws of the Commonwealth. “We have to work within the legal framework of the state,” he said. In other township news, the board of supervisors passed an ordinance allowing to assess local property owners for the costs of fire hydrants. Any property — developed or not — within 780 feet along a roadway will now be charged a yearly assessment. Most of the existing hydrants in the township are currently being maintained by local home owners associations — with property owners in those neighborhoods paying to the associations. With the new ordinance, those payments will go to the township, which will take over maintaining them. Township manager Jane Laslo said that the annual payments are likely to be in the $30 a year range.